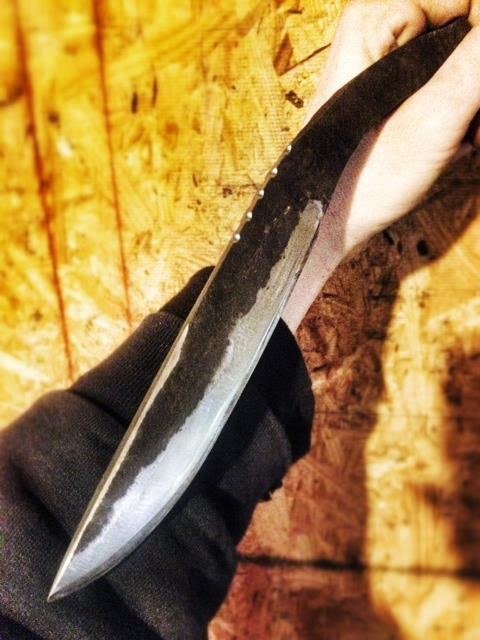 $350 special customs, damascus folded or pattern welded steels, heavy duty hand forged bowie/hunters, kukri, inlaid stones, sharp, sheathed, shipped. $700 - large fighting or tool axe with forged hammer on rear, hickory handle any length, leather cover. Average time is 6 weeks. Some special projects take longer, some items may be in stock and ready for immediate delivery. During camp season (June-August) orders may be delayed due to summer programs on the farm. Thank you. Found the prices.. sorry for my last post.. now just to order..
Can you do a hudson bay trappers survival knife? Razor sharp and tough as nails. Modeled after the popular camp knife used by fur traders in the 1800s, the Hudson Bay Knife is truly a versatile, multi-use cutting tool. Its large 8.5" 1075 HC steel blade is great for everything from chopping firewood to slicing meat and veggies, while the ergonomic walnut handle provides a secure grip for any cutting task. Like to order a small knife. Where can I do this at? My lady had a knife made for me by you. I own nearly 300 blades and your creation is hands down my favorite. Quality steel makes a sharp lasting edge. I hope this message finds you well and hammering out more for the world to enjoy. Thank you for the time and effort you put into my blade. Your prices are remarkable for the piece of usable art you ship out. Keep it up boss. Hurry up.Best switchblade knife available in USA. I'd love to buy a 300.00 knife we itch a nice handle and sharp knife....I would gladly send you a money order for it!!! With a nice handle that is strong and nice too!!! My info for you. Tane Clark, 11 Cottage Street , #1, Bayonne, New Jersey 07002, I'd really appreciate it Spencer!!! I would LOVE to order a knife from either of you. Please email me at CindiGordon1958@gmail.com when you can. I know you're swamped with orders, work, kids......but Please contact me as to how to get to your website. Thanks so much Gentlemen!